Do you have sign spinners where you live? You know, those people who twirl signs at street corners advertising local businesses. Jonathan and I had never seen so many until we moved to Colorado. They are everywhere: signs flipping and spinning, earbuds shoved in ears, jug of drinking water on the ground nearby. The BEST sign spinner worked the street in front of the Thornton Fazolis a few years ago. Our eldest daughter dubbed him "Purple Man." 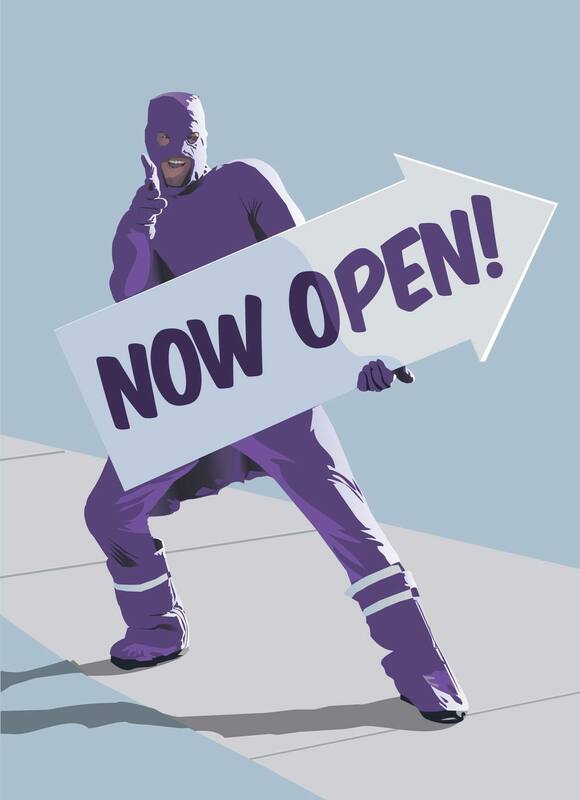 He was majestic: animated sign style, flowing cape, masked face. This is no overstatement: Purple Man rocked the 'burbs. One day, we pulled over. You might say we were compelled to. Who was this guy? Jonathan asked him if we could take a picture and we expressed our sincere admiration. THIS IS WHY THE WORLD IS AWESOME. Of course, Purple Man posed for us. Later, Jonathan made this illustration. Purple Man, wherever you may roam, we salute you. Thanks for visiting I Love Your Work, Jonathan Fenske. If you like Jonathan's illustrations, you can see more at www.jonathanfenske.com.